The road ahead is so packed that I – a curious shopper – barely make my way through the kaleidoscope of rainbow fabrics stacked to the roof of every street stand, beads sparkling in henna-embellished hands of merchants, and pots constantly spouting ginger- and cardamom-spiced clouds that tantalize passers-by to stop for a snack. Once in a while, an enormous purple blossom drops heavily from a nearby tree right in the middle of this fantastic scene, quickly crushed by a rushing foot, rickshaw, or hoof into what seems like a crimson vein nourishing the place. 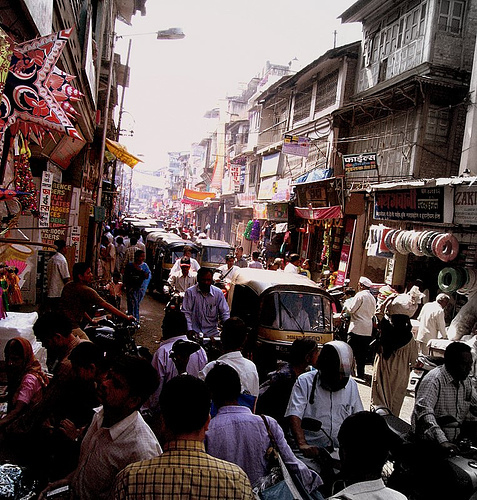 Typical spring day at the Sarojini Nagar market… Amazing how this ever-vibrant pulse of basic human urge to create and trade freely is in all of us, wherever we’re from. Why, then, are the macroeconomic outcomes around the world so different? The University of Delhi’s conference on the decade of change in Central and Eastern Europe may be over, but my quest for answers to the questions that brought me here is not. In the age of globalization, how can societies – be it my native Poland, India, or any other place undergoing socioeconomic transformation – trust in the goodness of institutional change that often uproots familiar structures? And how can we reconcile the thirst for liberty with the need to be responsible for one’s own circumstance? In recent years, it has become all too common in public discourse to rest on a rather simplistic answer to the questions that made me pause at the Indian bazaar: namely, that personal, political, and economic freedom is the ultimate solution to the woes of this world. While in principle correct, this answer does not hold much explanatory power as to why some countries manage to benefit from these many dimensions of creative freedom, when others struggle to implement the same principles. Neither does proclaiming ‘freedom’ as the panacea offer any clues on how it can be protected against a rising tide of agendas eager to compromise it in the name of security or equality. The answer I am looking for has to go deeper and address the conditions under which creative powers of freedom can be fully realized. The word “institutions” in vernacular has come to be equated with organizations, be it court, parliament, or the UN. But more precise meaning signifies a set of rules governing human interaction, both designed and evolved. Nobel Prize winner Douglas North focused on this definition of institutions, exploring the interplay between political and economic rule systems. In contrast with classical economics, which assumes perfect information and zero transaction costs in markets, North pointed out that this assumption is virtually never fulfilled in the real world. Instead, the costliness of economic exchange mandates creation of something so pervasive that we often forget it is there: institutions. Various informal constraints, formal rules, and mechanisms of enforcement keep all societies in motion. The problem is that “institutions are not necessarily or even usually created to be socially efficient; rather, they or at least the formal rules, are created to serve the interests of those with the bargaining power to devise new rules.” Consequently, institutions on the ground have a powerful inertia that in many cases perpetuates sub-optimal outcomes. Reforming them so that the trust in their merits can be built or restored is the challenge every society faces. All societies, whether developing of industrialized, rely on an ingrained set of norms, conventions, and codes of conduct rooted in tradition, religion, or ideology to guide day-to-day life. Under the conditions of limited information, these constraints evolved to help closely-knit networks of people make their interaction more structured and predictable. At the same time, outsider unfamiliar with local norms often suffers the consequences – it took me a few grossly overpriced rickshaw rides in Delhi to figure out how to bargain and what a reasonable fare is. Many informal rules are credited with reinforcing values which lead to development. For instance, Protestant culture espousing the virtues of hard work and self-reliance is often viewed as a crucial element of economic success of the early United States. Persistence of informal rules, however, also explains why the same formal political and economic systems introduced in different societies do not always produce equal results. One of the key problems of developing and post-communist countries today, for example, is that corruption has permeated so many areas of public and private life that in many cases it became an unwritten norm. According to the recent Transparency International’s global report, it is highly worrisome that political parties, legislature, police, and judiciary are widely perceived as most corrupt. A contemporary challenge of every society is to take a critical look at its own traditional norms and examine which of them may be antiquated or inhibiting creative freedom, since that often translates into a stunted political and economic potential. These are simply at the extreme end of the spectrum of informal constraints, as increasingly complex societies naturally move toward codifying their norms into formal legal systems of political, judicial, and economic rules. Yet, it is crucial to keep in mind that there is nothing inherently efficient about formalized rules and that in fact throughout history many of them have been used to restrict freedom of various social groups, sometimes accounting for the majority of a country’s population. Aside from extreme cases such as slavery or apartheid, a powerful example of a socially sub-optimal institution which benefits only selected group is the design of formal property rights in much of the developing world today. As a Peruvian economist Hernando de Soto explains, it is not the case that formal property rights do not exist there. Rather, they protect only small elite who can productively employ its assets, but leave the great majority of the population outside the “bell jar” of a functioning market economy, unable to turn whatever they possess into productive capital because no effective institutional mechanism exists for them to obtain formal property titles. De Soto estimates the amount of such dead capital in the world to equal $9.3 trillion, which on country-by-country basis translates into an untapped source of growth and wealth several times greater than domestic savings, foreign aid, or foreign investment. A stroll through a New Delhi alley, filled with shacks and tents containing life’s possessions of hundreds of people but illegally staked by their “owners,” provides ample illustration of this point. But industrialized societies are not free from inadequate formal rules either – it is enough to think of Enron or World.com to appreciate just to what degree. Our contemporary challenge is to strengthen property rights so that they include people who are presently excluded from the wealth-generating mechanisms of free market economy, and to reform regulations of the private sector so that every society can reap the benefits of advanced market economy without corporate abuse. Throughout history, humans have been trading with each other by means ranging from barter to e-commerce. In fact, what allowed Western economies to “take off” following the industrial revolution was not just that they were able to produce greater quantities of more advanced goods, but also that they designed efficient means for mass trade. Provision of the rule of law and enforcement of contracts creates such means, and it has been long postulated by economists as one of the principal roles for a superior political entity, the state. This neutral third party enforcement moves trade from the level of exchange between villagers at a local bazaar to shipping goods between parties who might have never personally met. Of course the state with a monopoly on coercion poses a threat to personal liberty of its citizens that all too often has been manifesting itself through oppressive regimes around the world. Yet, the inability of societies to create low-cost and efficient enforcement mechanisms for contracts can easily be regarded as one of the leading causes of persistent economic stagnation and political instability of developing countries. On the other end of the spectrum, in many liberal democracies – notably in Western Europe – the state has undertaken many additional responsibilities, namely to fund and administer social programs. In the face of slow economic growth and profound demographic shifts, however, these programs are no longer sustainable if left unchanged. Our contemporary challenge is to rethink the deep-seated institutional roots of economic underperformance, whether in developed or developing countries, and address the underlying problems. In developing and post-communist countries, enforcement of the rule of law must be robust enough to enable secure transactions. And industrialized countries whose trust in their crumbling welfare state arrangements has been shaken must remember that individual entrepreneurship and responsibility, supported by the key law enforcing role of the state, is what has brought them prosperity in the first place. Renown Austrian economist Friedrich Hayek said, “All that we can know is that the ultimate decision about what is accepted as right and wrong will be made not by individual human wisdom but by the disappearance of the groups that have adhered to the ‘wrong’ beliefs.” In his time, Hayek referred to totalitarian ideologies that trampled individual and political liberty in the name of utopian social justice. He understood that the presumption of centralized superior knowledge those ideologies demanded would eventually destroy the fabric of knowledge dispersed among all members of the society, which is the very core of creative freedom that simultaneously propels individual liberty and economic growth. But Hayek’s thought can be equally applied today to the significance of institutions: societies unable to critically evaluate their existing informal, formal, and enforcement rules – and unable to reform where needed – will not prosper. We all need ‘right’ institutions to provide us with reliable frameworks to creatively pursue opportunities for progress which happens in unforeseeable ways. That said, institutional reform is not easy. Changing one aspect, such as formal institutions, may not necessarily affect the others, such as informal rules. It takes time to alter not just written laws but habits, perceptions, and expectations, while in the meantime societies struggle with comprehending why the surrounding reality of the globalized world no longer fits their traditional way of life. The sense of security – be it derived from living in a familiar village or from protection of the welfare state – is often gone as if with the speed of stock market shifts. Furthermore, there is no universal recipe for an ideal set of institutions that could alleviate such feelings. But institutions that blindly stay committed to what no longer fits realities on the ground cannot succeed in the long term. That is why each country must seek answers uniquely suited to its local circumstances, and the answers cannot be limited to passing new laws or electing new leaders. Instead, we should work through free public discourse, research, education, and international dialogue to recognize worthy goals of institutional reform and raise awareness of where change is for the better and thus should not be feared – even if it entails adjustment. Another purple flower fell right under my feet into the buzzing din of Sarojini… Can it be that the underlying order of rules and norms – the life blood of this place – is a microcosm reflecting upon the nature of other universes of institutional complexity, including that of a state? If indeed, as anthropologist Clifford Geertz observed, “man is an animal suspended in webs of significance he has spun,” then how we shape the many rules allowing us to pursue that significance is of utmost importance. Not every order is productive, efficient, or just. If some of our current institutions do not maximize all aspects of creative freedom, we must take responsibility and not be afraid to seek change.